isn’t she just as glamourous as all get out? For months I have been like a cat on the prowl, stalking my garden for the colorful birds that twitter and tweet, frolic and play, chirp and swoop and flit around – all while my camera is tucked away in the quantum singularity known as my purse. I finally thought – ”Ivette – you are a garden blogger – why not have your camera with you EVERY TIME you are in the garden?” Hmmmm…. Of course, I zip in and out of the garden so many times I tend to forget that my camera is supposed to be permanently attached to my eyeball. But about a week or so ago, it all came together. I was sitting in the garden, on my daybed, having myself a little relax … my camera was at my side, the puppies were at my feet, and then I heard it. she turned her head and looked right at me. I snapped the picture. She lifted her beak into the air (which I think may be the hummingbird version of a Hi-5), and off she flew. With a few little chirps thrown back my way. I was SO happy! Mrs. Rufous was a very gracious guest – she can drop by unannounced any time! I hope she tells all her friends – Hummingbird party at The Germinatrix’s! All are invited!!! For starters, you did re-e-eally good; a hummingbird without blurry wings. Beautiful photo, Germi. Did you also know that hummingbirds are thought to be extremely good luck. I was told this when a Ruby-throated flew directly into a Hawaiian shirt I was wearing at an outdoor party. The shirt had red hibiscus flowers on it. It scared the bejeezus out of me; I thought at first it was a giant bee or some sort of flying beetle. One of the guests kept congratulating me on my good fortune. Wish I had been able to see what everyone else saw. Wonderful picture and equally wonderful description of how it came to be…I felt like I was there! 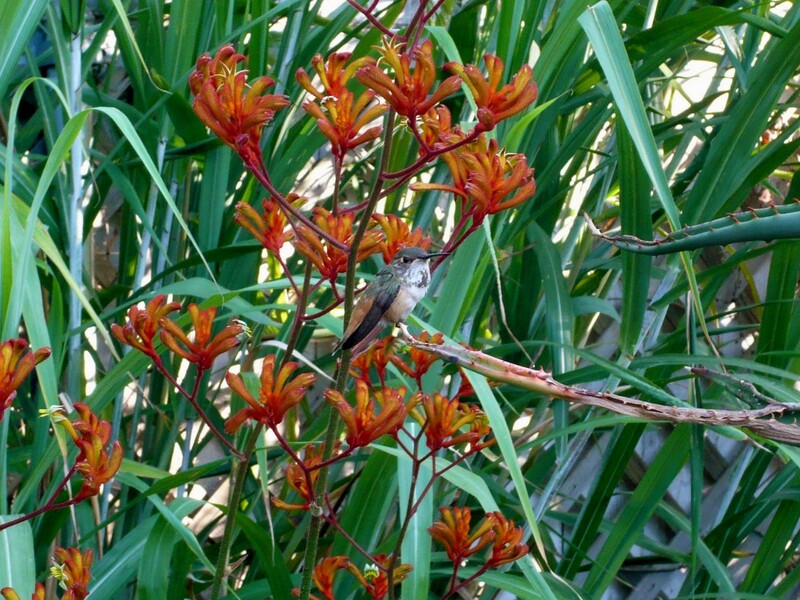 Since the Crocosmia are starting to bloom the hummingbirds are frequent visitors to our patio, I have hope of capturing the moment although I am sure I won’t do this great of a job. Dearest Tendril! You are also invited to the Hummingbird Party – but it will probably be an impromtu affair, knowing those flighty, flitty hummers! Maybe a fleet of them can fly you down here, like an arial version of Cinderella’s carriage! Can we BOTh wear Anigo in our hair? Say yes!!! Hi Expat! I FELT that hummingbirds were good luck, but I never knew it was a FACT! It makes sense – What else makes you feel like you are in a sudden bubble of enchantment? How awesome to have been chose by a hummer! I’ll bet it was a sight! Something similar once happened to me – I was watering in the garden wearing a red headscarf (I am actually wearing that same headscarf right this second!) and I felt and heard a frantic whirring and chirping right next to my ear – I swear I even felt a tiny swat of a wing! I turned just in time to see the confused little birdy whip away as fast as his little wings could take him. We have both been assaulted by hummers! Lucky us! Hey Loree! You WERE there … my aloes were standing guard, and wherever there is a sharp and spiky plant, your spirit isn’t far away! I am SO glad I’ve focused on planting hummingbird friendly plants in my garden … it just wouldn’t be the same without these beauties dropping in! But I have no crocosmias – silly me! I must remedy that right away … thanks for that! That is a neat looking hummer. Ours look totally different here in Texas. I will look for a picture, some you can see the difference. Either way though… a garden with w/out hummingbirds is like a bbq w/out ribs. See how I worked that in there. I turned something totally girly & beatiful… and wrapped it in bacon & slathered it with bbq sauce. You what is the best to me about this? That you have created such sanctuary she is feeling safe to stay with wings still, dogs a barking, camera’s a crashing and she knows…it’s all good, she is home here with your menagerie. And that in my opinion is a talent and a gift. Wow. Lucky you! I had a male Rufous visit me last year, but the Anna’s that have claimed the yard around my apartment ran him out of town. Haven’t seen any Rufous since. Fantastic shot of the hummer Ivette, and I know how hard it is to get a good shot of these tiny bug-birds! I have been trying for years. I had my best opportunity only last week, this particular hummer was getting really aggressive over my firecracker plant. He warped over to take care of a butterfly attempting to steal his bounty, then noticed that I was already there taking pictures of the butterfly. We had a western stand off moment, he was hovering perfectly at eye level about three feet away. I stood as still as a gun slinger until I remembered I was also a garden blogger and that this would make an amazing “shot,” ahem. The moment I went for my gun, the bug-bird “in a flash” ahem, ahem, was long gone. Your Anigozanthus is a jewel, you have to give us a macro of the inside / stamen that I can see in your photo. Great photo! We have many hummers in our garden, attracted to many different flowers. We also have a feeder outside the kitchen window..it can at times be literally swarming with the little beauties, and several varieties. With patience, you can cup your fingers around the feeder, standing motionless, and they will zip up and stand on your finger to take a sip of nectar! They will look you right in the eye and just keep on sipping…or you can say “licking”, as you can see their long thin tongues slipping into the hole and back out laden with nectar! I can close my eyes at anytime and still feel their tiny little feet grasping onto my finger…..EXTRAORDINARY!! Great capture! It sounds like she wanted her picture made. Good thing you had your camera at hand.